There has always been a strong debate in PEI over whether or not you’re an Islander who was born here, or you’re an Islander who was born somewhere else (more commonly known as a ‘come from away’, although I find the term derogatory). 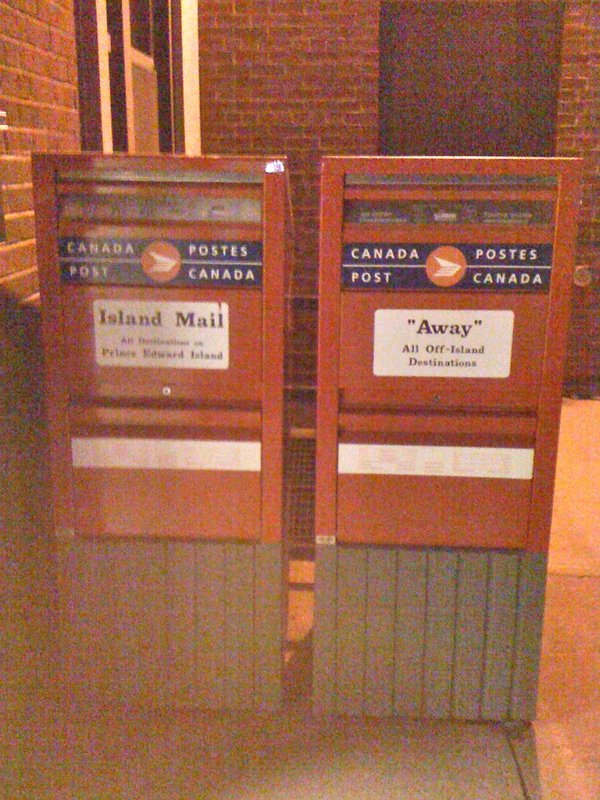 When I saw this Canada Post mailbox in a small town in P.E.I., I was a bit shocked, thinking, are there really just two states? Home, and Away? This got me thinking about the whole ‘home’ and ‘away’ dichotomy that exists in the hearts of islanders, particularly the ones who have lived “Away”. My brother Paul visited a few distant relatives during the Christmas season. They carried on the usual conversations, “how’s school going?”, “have you seen the snow?”, and “think it will stay long?” and then turned their attentions to me, asking him, “And where’s your sister now?” He would chuckle and answer that I did indeed live on the island, and that Mitchell and I had bought a house this year and “settled down”. They would be very glad to hear that. I first left the island for the big city of Montreal, at the tender young age of seventeen, I have traveled back and forth for years and years, my heart classically lonesome when I was away, and restless as soon as I got home. I came home to rest just months before Mitchell and I fell in love, and had Leila. The rest is history. In the Home state, I plan dinners with friends. I pack lunches and make beds, carrying on with the usual battery of texts and beeps that my phone emit. Each day runs its set course, rarely drifting from the daily schedules of my family members. Mitch and I kiss each other goodbye each morning on our way out the door, or sometimes through an open car window, thereby professing our love. I teach a conversation class to adult learners who come from Asia or the Middle East. I grocery shop endlessly, predictably losing my list each time that I leave the house. I volunteer, entertain babies and children, and read several books at a time. I cook a mean chicken curry. I am happy, somewhat. Although, an uncomfortable buzzing stirs in me. It’s the fires of the ages past, the memories of a boat trip through the Philippines or the hot, dense jungles of Mexico. It’s the serene bamboos of Bali, and the furious city lights of Taipei. It’s the rice fields over which the sun sets, endlessly, taking me with it, each time it goes. When I’m Away, I drink up life as if intensely thirsty. I devour museums and city streets. Mitch and I just spent five days in the New Years Eve Madness of New York City, and talk about an endless fury of sparkles and shows and break-dancers. Seeing Phish, a particular favorite from my pre-Leila days, was itself a magical adventure. 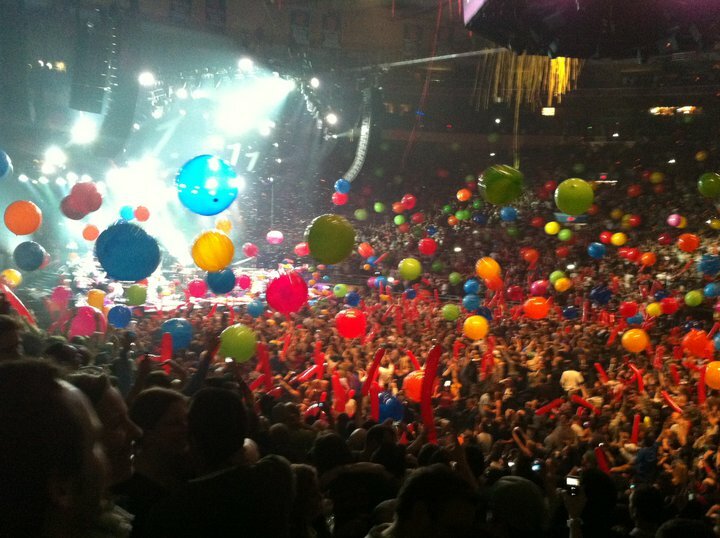 Picture yourself at this balloon dance. When I’m away, it’s like everything is possible. I am overwhelmed by the rich beauties that life has to offer, and mindful of them. For a moment I become invincible, brilliantly anonymous, and exotic. I am a rare bird or flower. I belong to the Universe. I am one with time and space. In the third state, i am Home from Away. I return to a state of comfortable normalcy, enjoying my own home, family, cats. I bathe peacefully in the waters of relaxation, waiting only again for the moment when life will stir again, and i will begin to fantasize about life’s next adventure. Next: Let’s Start a Movement! To the wandering souls, and rooted travelers. As comforted as I am with being home. Away is exciting and exhilarating and the soul does scream for it. But there is something so special in coming home after you have been away!! Home is where the heart is!! Ah! So well put. The lingering bliss of Home from Away… hey, I wanna go Away again!